Sutton Hoo ceremonial helmet (British Museum, restored). Although based on late Roman helmets of spangenhelm type, the immediate comparisons are with contemporary Vendel Age helmets from eastern Sweden. Sutton Hoo, near Woodbridge, Suffolk, England, is the site of two Anglo-Saxon cemeteries of the sixth and early seventh centuries. One contains a ship burial, a rare occurrence in England, including a wealth of artifacts of outstanding art-historical and archaeological significance. Although it is the ship-burial which commands the widest attention from tourists, there is also rich historical meaning in the two separate cemeteries, their position in relation to the Deben estuary and the North Sea, and their relation to other sites in the immediate neighborhood. The site of Sutton Hoo and the findings there have proven to be central to the understanding of the Anglo-Saxon Kingdom of East Anglia, a time in history which for many academics was difficult to understand because it sits on the margin between myth, legend, and historical documentation. Sutton Hoo from the Deben tideway (Mound 2 visible on the horizon above the farm). 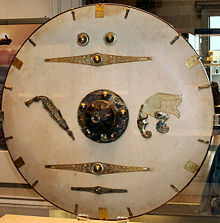 Sutton Hoo is an area spread along the bluffs on the eastern bank of the River Deben opposite the harbor of Woodbridge. About 7 miles (15 km) from the sea, it overlooks the inland waters of the tidal estuary a little below the lowest convenient fording place. The tidal reaches of the Deben form one of a group of estuaries which drain from the south-eastern side of the county of Suffolk into the North Sea. From north to south these are the Alde (at its mouth called the Ore), the Butley river, the Deben and the Orwell, which at its mouth joins with the more southerly River Stour. These rivers formed paths of entry to East Anglia during the continental migrations to Britain of the fifth and sixth centuries, following the end of Roman imperial rule, and their control was important both in Roman and Anglo-Saxon times. A Roman stone shore-fort stood on high ground near the mouth of the Deben on the south side, at Walton. Of the two gravefields found here, one ('the Sutton Hoo cemetery') has always been known to exist because it consists of a group of around 20 earthen burial mounds which rise slightly above the horizon of the hill-spur when viewed from the opposite bank. The other (called here the 'new' burial ground) is situated on a second hill-spur close to the present Exhibition Hall, about 500 meters upstream of the first, and was discovered and partially explored in 2000 during preparations for the construction of the Hall. This also had burials under mounds, but they were not known because they had long since been flattened by agricultural activity. The discovery of the Sutton Hoo site is due, in part, to Mrs. Pretty, who in 1900, owned the land where the remains were discovered. Spurred on by her belief in Spiritualism and local lore, Mrs. Pretty sought out the help of local historians and academics to help her solve the mystery of the mounds that existed on her property. In 1938, Through the Ipswich Museum, she obtained the services of Basil Brown, an amateur archaeologist. She took Brown to the site, and suggested that he start digging at Mound 1, one of the largest. The mound had obviously been disturbed, and in consultation with Ipswich Museum Brown decided instead to open three smaller mounds during 1938 with the help of three estate laborers. These did reveal interesting treasures, but only in fragments as the mounds had been robbed. Mound 11 (front left), Mound 10 (foreground, masking Mound 1), Mound 2 (middle distance) and Sutton Hoo House, coachhouse and stables: looking north. Mrs. Pretty still wanted a full excavation of Mound 1 and, in May 1939, Brown began work helped by the gamekeeper and the gardener. Driving a trench from the east end they soon discovered ship-rivets in position, and the colossal size of the find began to dawn on them. After patient weeks of clearing out earth from within the ship’s hull they reached the burial chamber and realized it was undisturbed. It lay beneath the exact spot where Mrs. Pretty had told him to dig a year previously. In June 1939 Charles Phillips of Cambridge University, visited Ipswich Museum and was taken by Mr Maynard, the Curator, to the site. Within a short time Phillips undertook the excavation of the burial chamber. He assembled a team of experts while Basil Brown continued to clear the ship. The excavation was overshadowed by the imminence of war with Germany. The finds, having been packed and removed to London, were brought back for a Treasure Trove Inquest held in the autumn at Sutton village hall. Brown, who remained loyal to his employer Mrs. Pretty throughout, gave his testimony with the rest, and it was decided that since the treasure was buried without any intention of recovery, it was the property of Mrs. Pretty as landowner. In an act of almost unrivaled generosity she decided to bequeath the treasure as a gift to the whole nation, so that the meaning and excitement of her discovery could be shared by everyone. Model of the 1939 find (chamber area outlined). The first major excavations of Sutton Hoo revealed a large and complex site, compromising about 20 barrows and establishing that this was no general burying-ground, but was reserved for a select group of individuals buried with objects denoting unusual wealth or prestige. Most had been cremated, and each barrow was raised to commemorate one particular person. It was used in this way for about 50–60 years during the last quarter of the sixth and the first quarter of the seventh centuries. Unfortunately, the excavation also revealed that almost all of these graves had been plundered. Still, a wealth of information was extracted from each grave site. Of the two cremations excavated in 1938, Mound 3 contained the ashes of a man and a horse placed on a wooden trough or dugout bier, together with an iron-headed throwing-axe (a Frankish weapon). The grave also contained objects imported from the eastern Mediterranean area, including a bronze ewer (lid only), part of a miniature carved plaque depicting a winged Victory, and fragments of decorated bone from a casket of similar origin. In Mounds 5, 6, and 7 three cremations deposited in bronze bowls were found together with a variety of grave goods. The man in Mound 5 had died from weapon blows to the skull. With him some gaming-pieces, small iron shears, a cup, and an ivory box with sliding lid had escaped the looters' attention. Mound 7 was the remains of a grand cremation, in which horse, cattle, red deer, sheep, and pig had been burnt with the deceased on the pyre. His goods had included gaming-pieces, an iron-bound bucket, a sword-belt fitting, and a drinking vessel. Mound 6, similarly, was accompanied by cremated animals, gaming-pieces, a sword-belt fitting, and a comb. The Mound 18 grave was very damaged, but of similar kind. Most impressive of the burials not contained in a chamber is the Mound 17 grave of a young man and his horse. They were in fact two separate grave-hollows side by side under a single mound, and were undisturbed (looters had dug over the intervening baulk). The man was buried in an oak coffin with his pattern welded sword at his right side. The sword-belt was wrapped around the blade, with a bronze buckle with garnet cellwork, two pyramidal strapmounts and a scabbard-buckle. By his head were a strike-a-light, and a leather pouch containing rough garnets and a piece of millefiori glass. Around the coffin were two spears, a shield, a small cauldron and bronze bowl, a pot and an iron-bound bucket. Some animal ribs were probably a food offering. In the north-west corner of the man's grave was the bridle for the horse, mounted with circular gilt bronze plaques bearing deftly-controlled interlace ornament. These are displayed in the Exhibition Hall at Sutton Hoo. One of the Sutton Hoo burial mounds. 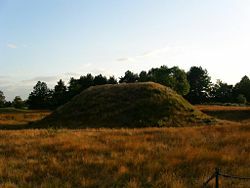 This picture, taken during the Summer Solstice sunset on 21 June 2006, shows Mound 2 which is the only one of the Sutton Hoo mounds to have been reconstructed to its supposed original height. Alternate view. This extremely important grave, damaged by looters, was excavated in 1938 by Basil Brown. Chemical analysis of the chamber floor suggested the presence of a body in the south-western corner. The goods, although very fragmentary, included an English blue glass cup with trailed decoration (like those from various English chamber-graves including the new find at Prittlewell, Essex), two gilt-bronze discs with animal interlace ornament, a bronze brooch, a silver buckle, a gold-coated stud from a buckle and other items. Four objects (apart from the boat) have a special kinship to those from the Mound 1 ship-burial. The tip of a swordblade showed elaborate pattern-welding similar to the Mound 1 sword: silver-gilt drinking horn mounts were struck from the same dies as the Mound 1 horn-mounts: and two fragments of dragonlike mounts or plaques probably derived from a large shield of Vendel type, similar to the Mound 1 shield. Although the rituals were not identical, the association of these objects and the ship in this grave shows an immediate connection between the two burials. In contrast to the high status evident from these finds, the cemetery also contained a number of inhumations of a very different character. These were of people who had died by violent means, in some cases clearly by hanging or beheading. Often the bones had not survived, but this important part of the site's history was recovered by a special technique during the 1980s excavations. The fleshy parts of the bodies had left a stain in the sandy soil: this was laminated as work progressed, so that finally the emaciated figures of the dead were revealed. Casts were taken of several of these tableaux. The executions are evidently later than Mound 5, and possibly date mostly from the eighth and ninth centuries. Although practically none of the original timber survived, the excavated form of the ship in Mound 1 presented a very perfect image in 1939. A stain in the sand had replaced the wood but had preserved many details of the construction, and nearly all of the iron planking rivets remained in their original places. Hence it was possible to survey and describe what was merely a ghost of the original ship. She was about 27 meters (c 90 feet) long, pointed at either end with tall rising stem and stern posts, widening to about 4.4 meters (c 14 feet) in the beam amidships with an inboard depth of about 1.5 meters (c 4 ft 10 ins) over the keel line. From the keel board the hull was constructed clinker-fashion with nine planks on either side, the overlaps fastened with rivets. Twenty-six wooden frames strengthened the form within, more numerous near the stern where a steering-oar might be attached. Repairs were visible: this had been a seagoing craft of excellent craftsmanship, but there was no descending keel. Reconstructed model of the burial-chamber. Alternate view. The excavators found no trace of a body, and originally suggested that the grave was a form of cenotaph. However the arrangement and type of the buried goods, and the knowledge that the soil could dissolve bone, left little doubt that this was a burial with a body, and that it was placed in the center of the chamber with the feet to the east. A phosphorus survey indicated higher levels of phosphorus in the area supposed to have been occupied by the body. Some long time (perhaps many decades) after burial the roof collapsed violently under the weight of the mound, compressing the goods into a seam of earth. The body lay on or in a central wooden structure about 9 feet long, possibly a platform or a very large coffin (interpretations vary). An iron-bound wooden bucket stood on the south side of this, and an iron lamp containing beeswax and a small wheel-thrown bottle of north continental make at its south-east corner. At the center of the wall was a long square-sectioned whetstone tapered at either end and carved with human faces on each side. A ring mount topped by a bronze stag figurine was fixed to the upper end, so that it resembled a late Roman consular sceptre. South of this was an iron-bound wooden bucket, one of several in the grave. Other artifacts found in the ship include a Coptic or eastern Mediterranean bronze bowl with drop handles and chased with figures of animals, a six-stringed Anglo-Saxon lyre in a beaver-skin bag, an iron-bound tub of yew with a smaller bucket within, two small bronze cauldrons, one globular and one concave-sided, a 'crested' and masked helmet, wrapped in cloths, a set of spears, tips uppermost, and a sword with gold and garnet-cloisonné pommel (85 cm or 34in long), its pattern-welded blade within its sheath. Reproduction of the lyre by Messrs Dolmetsch. The burial chamber was evidently rich in textiles, represented by many fragments preserved, or replaced by metal corrosion products. They included quantities of twill (possibly from cloaks, blankets or hangings), and the remains of cloaks with characteristic long-pile weaving. There appear to have been more exotic colored hangings or spreads, including some (possibly imported) woven in stepped lozenge patterns using a Syrian technique in which the weft is looped around the warp to create a textured surface. Two other color-patterned textiles, near the head and foot of the body area, resemble Scandinavian work of the same period. Finally the burial was completed by the construction of a long and high oval mound which not only completely covered the ship but rose above the horizon at the west or riverward side of the Sutton Hoo cemetery. Although the view to the river is now obscured by Top Hat Wood, it was doubtless originally intended that the mound should brood visibly on the bluff above the river as an outward symbol of power to those using the waterway. On present evidence, this magnificent funeral appears to have been the final occasion upon which the Sutton Hoo cemetery was used for its original purpose. Long after the mound was raised the westerly end of it was dug away when a medieval boundary ditch was laid out. Therefore when looters dug into the apparent center during the sixteenth century they missed the real center: nor could they have foreseen that the deposit lay very deep in the belly of a buried ship, well below the level of the land surface. Great pains had been taken to ensure that it remained undisturbed for a very long time. During the year 2000 an excavation was made by a Suffolk County Council team on the site intended for the National Trust visitor center. The site lies some distance north of Tranmer House, at a point where the ridge of the Deben valley veers westwards to form a promontory and a south-western prospect across the river is afforded. 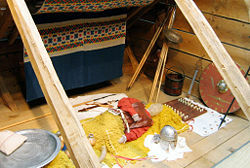 A large area of topsoil was removed, in one corner of which a number of early Anglo-Saxon burials were discovered, some being furnished with objects of high status. The following discoveries were of particular note. Attention was first attracted to this area by the chance discovery of a rare imported artifact of eastern Mediterranean origin of the sixth century. It is part of a vessel of thin beaten bronze with vertical sides, made to contain a beverage. The outer surface is decorated with a frieze of Syrian or 'Nubian' style depicting naked warriors carrying swords and shields in combat with leaping lions, executed by punch-marking. Above the frieze and below the rim is a zone of inscription in Greek lettering which translates 'Use this in good health, Master Count, for many happy years.' This is very likely to have derived from a furnished burial. In an area near to Mrs. Pretty's former rose garden a group of moderate-sized burial mounds was identified. The mounds had long since been leveled, but their position was shown by circular surrounding ditches. At the center of each was a small deposit indicating the presence of a single burial, probably of unurned human ashes. This burial lay in an irregular ovate pit which contained two vessels. One was a stamped black earthenware urn of late sixth century type. The other was a large bronze hanging bowl in excellent condition, with openwork hook escutcheons (without enamel) and a related circular mount at the center of the bowl. The mounts are very similar to an example found at Eastry, Kent (possibly a seventh century royal dwelling). In this burial a man was laid out with a spear at his side and a shield of normal size over him. The shield bore two fine metal mounts, one depicting a predatory bird (not unlike the shield from the ship) and the other a thin dragon-like creature, and the boss-stud was also ornamented. The Vendel-type connections with Mound 1 were significant. Shoulder-clasps. Alternate view. British Museum. Sutton Hoo is a cornerstone of the study of art in Britain in the sixth–ninth centuries. Professor Henderson, summarizing, calls the ship treasures "the first proven hothouse for the incubation of the Insular style." A full assemblage of objects of very varied origins are combined among the possessions of a person of the highest social degree. The gold and garnet fittings show the creative fusion of foregoing techniques and motifs derived from them, by a master-goldsmith working for such a patron. From the gathering together of such possessions, and the combination or transformation of their themes and techniques in new productions, the synthesis of Insular art emerges. Drawing on Irish, Pictish, Anglo-Saxon, native British and Mediterranean artistic sources, Insular art is a fusion more complex than the purely Anglo-Irish expressed by "Hiberno-Saxon" art. The seventh century Book of Durrow, first survival of the gospel-book series including the Lindisfarne Gospels and the Book of Kells, owes as much to Pictish sculpture, to British millefiori and enamelwork and Anglo-Saxon cloisonné metalwork, as to Irish art. This fusion in the Sutton Hoo treasury and workshop precedes the (often royal) religious context of the scriptoria. There is thus a continuum from pre-Christian royal accumulation of precious objects from diverse cultural sources, through to the art of gospel-books, shrines and liturgical or dynastic objects in which those elements were blended. It is a parallel expression of the formation of English and Insular cultural identity, and the dissemination of royal values. That is part of the fascination of Sutton Hoo. ↑ S. E. West, A Corpus of Anglo-Saxon Material from Suffolk. (East Anglian Archaeology 84: Suffolk County Council 1998). ↑ C.W. Phillips, 1940, "The Excavation of the Sutton Hoo Ship-burial," Antiquaries' Journal 20 part 2 (April 1940): 149–202. ↑ M.M. Mango, C. Mango, A.C. Evans and M. Hughes, 1988, A sixth century Mediterranean bucket from Bromeswell parish, Suffolk, Antiquity 63 (239), 295–311. ↑ G.D.S. Henderson and I. Henderson, The Art of the Picts. Sculpture and Metalwork in Early Mediaeval Scotland. (London: Thames and Hudson, 2004). ↑ G.D.S. Henderson, From Durrow to Kells: The Insular Gospel-Books 650–800. (Oxford: 1987). Arrhenius, B. "The chronology of the Vendel graves" In J.P. Lamm and H.-A. Nordström Vendel Period Studies. Museum of National Antiquities. Studies 2 (1983):39–70. Arwidsson, G. "A new Scandinavian form of helmet from the Vendel time" In Acta Archaeologica 5 (1934): 243–257. Bede, Venerable. Historia Ecclesiastica Gentis Anglorum. ed. B. Colgrave and R.A.B. Mynors. Oxford, 1969. Brown, Basil J.W., Rupert L.S. Bruce-Mitford, Charles W. Phillips. Oxford Dictionary of National Biography. Bruce-Mitford, R.L.S. Aspects of Anglo-Saxon Archaeology: Sutton Hoo and other Discoveries. London: Gollancz, 1974. Bruce-Mitford, R.L.S. 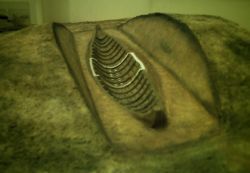 et al., The Sutton Hoo Ship-Burial. (3 Vols in 4). London: British Museum, 1975, 1978, 1983. Campbell, J. "The Impact of the Sutton Hoo discovery" In The Anglo-Saxon State. London: Hambledon and London, 2000. Caruth, J., and S. Anderson. "RAF Lakenheath Anglo-Saxon Cemetery" In Current Archaeology 163 (1999): 244–250. Carver, M.O.H. The Age of Sutton Hoo. The Seventh Century in North-Western Europe. Woodbridge, 1992. Carver, M.O.H. (ed.). Bulletins of the Sutton Hoo Research Committee 1983–1993. Boydell, Woodbridge, 1993. Carver, M.O.H., A.C. Evans, C. Fern., and M. Hummler. Sutton Hoo: A Seventh-century Princely Burial Ground and its Context. Report of the Research Committee of the Society of Antiquaries of London. London, 2005. Clark, J.G.D. "The Prehistoric Society: From East Anglia to the World" In Proc. Prehistoric Society 51 (1985): 1–14. Crumlin-Pedersen, O. The Ship as Symbol in Prehistoric and Medieval Scandinavia. Copenhagen, 1995.
du Chaillu, P. The Viking Age. (2 Vols). John Murray, London, 1889. Evans, A.C. The Sutton Hoo Ship Burial. British Museum, London, 1986. Evans, A.C. "Sutton Hoo,Snape, Vendell and Valsgarde" In P. Hulten The True Story of the Vandals. Museum Vandalorum, Varnamo, 2001, 48–63. Engstrom, R. et al. A Modern Replication Based on the Pattern-Welded Sword of Sutton Hoo. Western Michigan University, 1990. Fairclough, J., and S. Plunkett. "Drawings of Walton Castle and other monuments in Walton and Felixstowe" In Proc. Suffolk Institute of Archaeology 39(4) (2000): 419–459. Farrell, R.T. Beowulf, Swedes and Geats. London, 1972. Farrell, R. and C. Neuman de Vegvar (eds.). Sutton Hoo: Fifty Years After. Miami/Ohio, 1992. Filmer-Sankey, W. and T. Pestell. Snape Anglo-Saxon Cemetery: Excavations and Surveys 1824–1992. East Anglian Archaeology 95, Suffolk County Council, 2001. Green, C. Sutton Hoo: The Excavation of a Royal Ship-Burial. London, 1963. Heaney, S. Beowulf. Faber, 1999. Henderson, G.D.S. Vision and Image in Early Christian England. Cambridge, 1999. Henderson, G.D.S., and I. Henderson. The Art of the Picts. Sculpture and Metalwork in Early Mediaeval Scotland. Thames and Hudson, London, 2004. Henderson, G.D.S. From Durrow to Kells: The Insular Gospel-Books 650–800. Oxford, 1987. Kendall, C.B. and P.S. Wells. Voyage to the Other World: The Legacy of Sutton Hoo. University of Minnesota, 1992. Mango, M.M., C. Mango, A.C. Evans and M. Hughes. "A 6th century Mediterranean bucket from Bromeswell parish, Suffolk" In Antiquity 63 (239) (1988): 295–311. Mayr-Harting, H. The Coming of Christianity to England. New York, 1972. Newton, S. The Origins of Beowulf and the Pre-Viking Kingdom of East Anglia. Cambridge, 1993. Newton, S. The Reckoning of King Rædwald: The Story of the King linked to the Sutton Hoo Ship-Burial. Brightlingsea, 2003. Phillips, C.W. "The Excavation of the Sutton Hoo Ship-burial" In Antiquaries' Journal 20(2) (1940): 149–202. Phillips, C.W., T.D. Kendrick, E. Kitzinger, O.G.S. Crawford, W.F. Grimes and H.M. Chadwick. "The Sutton Hoo Ship-Burial" In Antiquity (March 1940). Plunkett, S.J. "The Suffolk Institute of Archaeology: its Life, Times and Members" In Proc. Suffolk Institute of Archaeology. 39(2) (1998):165–208. Plunkett, S.J. "Sutton Hoo: the silver spoons and bowls, the whetstone and the buckle" In P. Hulten (ed.) The True Story of the Vandals. Museum Vandalorum, Varnamo, 2001, 65–75. Plunkett, S.J. Suffolk in Anglo-Saxon Times. Tempus, Stroud, 2005. Scarfe, N. Suffolk in the Middle Ages. Boydell, Woodbridge, 1986. Stolpe, H., and T.J. Arne. La Necropole de Vendel. Stockholm, 1927. Wade, K. "Gipeswic—East Anglia's first economic capital, 600–1066" In N. Salmon and R. Malster (Eds. ), eIpswich from the First to the Third Millennium. Ipswich, 2001, 1–6. Warner, P. The Origins of Suffolk. Manchester, 1996. West, S.E. A Corpus of Anglo-Saxon Material from Suffolk. East Anglian Archaeology 84: Suffolk County Council, 1998. West, S.E., N. Scarfe and R. Cramp. "Iken, St Botolph, and the coming of East Anglian Christianity" In Proc. Suffolk Institute of Archaeology 35(4) (1984): 279–301. Sutton Hoo. Official site at the National Trust. "Sutton Hoo: the grandest Anglo-Saxon burial of all", from Current Archaeology magazine 17 November 2002. "Sutton Hoo". By James Grout, from the Encyclopædia Romana. Sutton Hoo: Burial-Ground of the Wuffings, by Sam Newton. This page was last modified on 10 November 2015, at 23:24.